Coverage: Watch live on BBC Red Button, iPlayer, Connected TVs, BBC Sport website and app. 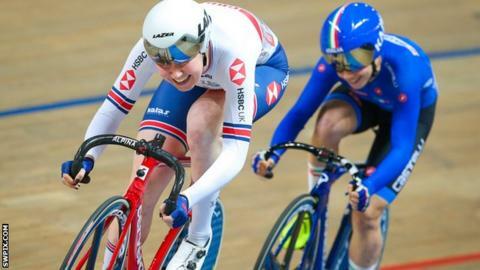 Concussed Katie Archibald has been withdrawn from Saturday's madison race after a bad crash at the Track Cycling World Championships in Poland. British Cycling said Archibald had initially been deemed fit to continue after falling heavily in Friday's omnium event. But overnight she "developed signs of concussion". Elinor Barker will now partner Neah Evans. Barker won gold in the 10km scratch race on the opening day. Stephen Park, performance director for British Cycling, said: "Fortunately, we have so much strength in depth in our women's endurance squad that we can bring in Olympic champion Elinor Barker, who has shown great form so far this competition as demonstrated with her two medals so far this week. "On behalf of the team, I wish Katie a fast recovery and I'm sure we will see her back to her best very soon." Archibald, 24, had only been racing in the multi-event omnium as a replacement for four-time Olympic gold medallist Laura Kenny - who pulled out through illness. She managed to finish seventh after recovering from a crash with America's Jennifer Valente. Britain remain third in the medal table.